Noval is mentioned in land registries going back to 1715, and has been sold just twice in that time, once in the late 19th century, and to its present owners in 1993. Noval has, however, a reputation for being an innovative, independent producer. Noval’s focus on its vineyard and estate ports distinguishes it. 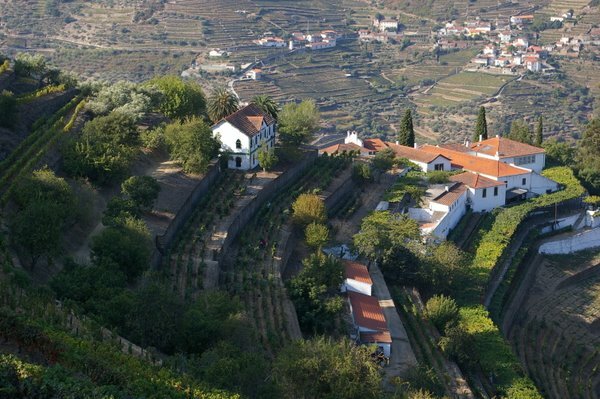 Throughout the upper Douro, a wet spring and summer drought conditions that year reduced grape production overall. However, the mild temperatures through the year enabled the vines to reach excellent maturity. It was decided that the harvest would start one week later than normal at Noval. This was a huge success with the grapes that were picked small but perfectly formed, with outstanding flavour and freshness in the musts. The Quinta do Noval Silval Vintage Ports today offer wonderful value for money. This eccentric late release (the wine was bottled in 2003) was made entirely from grapes of Quinta do Silval, and selected high grade "A" vineyard in Cima Corgo, in the heart of the Douro Valley. Pure aromatic nose is really fresh with lovely definition and great purity of sweet blackberry and raspberry fruit. The palate is fresh and supple with lovely pure summer pudding fruit and some nice spicy structure. Nicely defined. Quinta do Noval Vintage Port is only declared when various factors combine to make an exceptional year. Intensely powerful and concentrated, these wines are adapted to age in bottle, developing overs years and releasing a complex variety of flavours. The 1995 has is a tawny / orange colour. It has a lovely dried fruits aroma that is pleasant and spiced.Light in the taste but with a dominating tannin, after taste is short. This is mature and ready for drinking but will hold for many years to come. Cherry red colour. Quite pale. Herby spicy nose leads to a soft, evolved palate that is now quite mature, with appealing warmth. Like a tawny port in style. Medium dark red towards garnet, with plum, ripe berry, chocolate and tar aromas and flavors, this medium-bodied Port is now showing very nicely in its maturity. Moderate and very soft tannins, with sweet tobacco and cherry flavors on the finish. A very rare bottle of "Crusted port" a blend of more than one vintage. The 1962 Noval (bottled 1965) is actually a blend of 1/3 Nacional 1962 and 2/3 Noval 1963. Normal convention is to label the bottle with the bottling date. "Bottled in the UK by Hedges & Butler. Described by Hedges & Butler as "2/3rds of the blend is the regular Noval 1963 and 1/3rd is the Noval Nacional 1962; bottled in 1965". A beautiful and extremely rare bottle. The 1957 Quinta Do Noval LBV was produced by the traditional Port method, with a long, intense maceration during alcoholic fermentation with the aim of extracting tannin, colour and flavour from the skins. This was done both by foot-treading in traditional granite lagars (shallow vats), and by pumping over. Fermentation temperatures and densities were carefully monitored to choose the ideal moment to fortify. The wines remained in the Douro until the spring when they were transported to Vila Nova de Gaia to mature in large oak vats. Mature tawny colour, attractive bouquet with spice and liquorice on the nose. Medium body and long finish. An attractive port from a classic vintage. Extremely rich and powerful nose, with complex velvety layers of dry fruits, toffee, and some ethereal spicy aromas . On the palate it shows tremendous depth and concentration, with good acidity, well balanced, providing a slightly dry, very long, lingering finish. This is a very rare bottle of the outstanding 1931 Vintage Port year. Quinta Do Noval 1931 is one of the greatest Vintage Ports ever made! This bottle was imported by Sandeman & Son, Glasgow (visible on embossed capsule) and later on labelled and sold by Edward Sheldon Ltd., in Warwickshire. Some interesting history here on port distribution in the early 20th century.